Marvel not only rolled out the new Infinity War trailer earlier today, but the studio also opened advanced ticket sales, and it only took a few hours for the movie to set a new record. 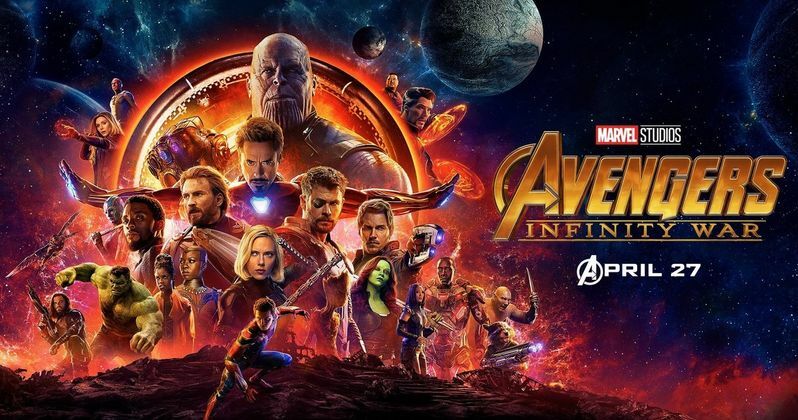 Fandango has announced that Infinity War has already become the best-selling superhero movie in advanced pre-sales, taking just six hours to surpass both Batman v Superman: Dawn of Justice and the most recent record-holder, Marvel's Black Panther, with tickets going on sale at 6 AM PM/9 AM ET today. Fandango also surveyed 1,000 ticket buyers earlier today, which revealed some interesting details about what moviegoers want to see in Avengers: Infinity War. A whopping 97% of ticket buyers are excited to see, "how dozens of heroes work together in the same film," while 94% of those surveyed were excited to see characters from different parts of the MCU meeting each other for the first time. The new trailer even featured one such meeting, with Peter Parker (Tom Holland) meeting Doctor Strange (Benedict Cumberbatch). 92% believe Infinity War is "the culmination of all the MCU films before it," even though Avengers 4 will be hitting theaters next May, as the final Marvel Phase 3 movie, and 87% have seen every one of the MCU movies to date. What's also interesting is that the success of Black Panther is helping create buzz for Avengers: Infinity War. 71% of those surveyed said that have seen Black Panther on the big screen, while 60% said that Black Panther "made them even more excited to see Avengers: Infinity War". For those who haven't already purchased their tickets yet, the Fandango FanShop is giving away a free Avengers poster, designed by artist Kaz Oomori, with every Fandango VIP ticket purchase. Fans can choose one of five posters, which will feature MCU heroes such as Black Panther, Okoye, Iron Man, Captain America, Spider-Man, Hulk, Black Widow and the Guardians of the Galaxy, to name just a few. This new record shouldn't come as much of a surprise, since Fandango users voted Avengers: Infinity War as the most anticipated movie of 2018. As of now, limited box office predictions have been made, but it's possible that it could finally surpass the Marvel Cinematic Universe opening weekend record of $207.8 million, set back in 2012 by The Avengers. That figure stood as the highest opening weekend ever for several years, before it was ultimately beat by Jurassic World ($208.8 million) and the current opening weekend record holder, Star Wars: The Force Awakens ($247.9 million). With this movie uniting essentially the entire Marvel Cinematic Universe, it very well could set multiple box office records. These impressive pre-sales figures also come after Marvel inexplicably shifted the release date, from the traditional first weekend in May (May 4) that signifies the start of the summer movie season, to the last weekend in April (April 27), traditionally a dumping ground for movies the studio aren't confident about, before the summer movie season. This, paired with Black Panther's astronomical success in the month of February, could lead to Marvel experimenting with non-traditional release dates as we get into the studio's Phase 4 lineup. If you haven't bought your tickets for Avengers: Infinity War, you can do so at Fandango.com.